In my earlier post, I wrote about the three sons of my great-great-aunt Rosalie Schoenthal and her husband Willy Heymann: Lionel, Walter, and Max. All three had left Germany and settled in Chicago by 1939. Chicago Tribune, December 2, 1966, Ancestry.com. Historical Newspapers, Birth, Marriage, & Death Announcements, 1851-2003 [database on-line]. 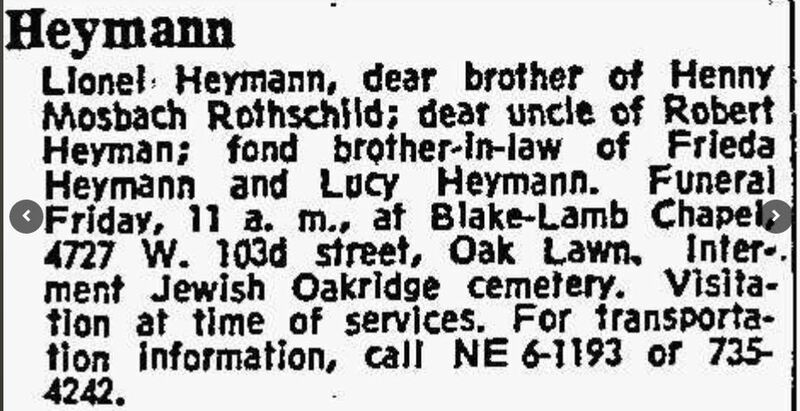 According to the obituary, Lionel Heymann had had a long and distinguished career as a photographer. 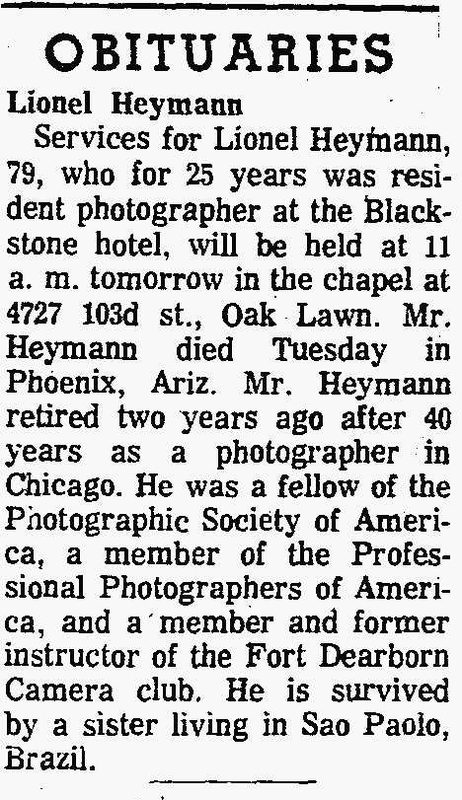 The obituary states that he had retired in 1964 after 40 years as a photographer in Chicago, including 25 years as the photographer at the Blackstone Hotel. That is, although Lionel consistently listed his occupation as a waiter on various government forms, if the obituary is for the same man, he had been working as a photographer since 1924—in other words, since his very earliest days in Chicago. But was this in fact the same Lionel Heymann? The name and age and residence in Chicago certainly made it seem so, but there were no named survivors in the obituary, just an unnamed sister living in Brazil. Could this be my cousin? This obviously was my cousin, whose two sisters-in-law were named Frieda and Lucy (or Lucie). He was in fact the photographer described in the first obituary. And he was not just a hotel photographer taking snapshots of guests. When I Googled his name and “photographer,” a number of links popped up, listing Lionel as an artist whose works are still being auctioned by various art houses, online and elsewhere. Lionel also wrote articles about photography and lectured frequently about the art of portrait photography. His works include portraits, nudes, architectural works, and highly stylized artistic photographs. 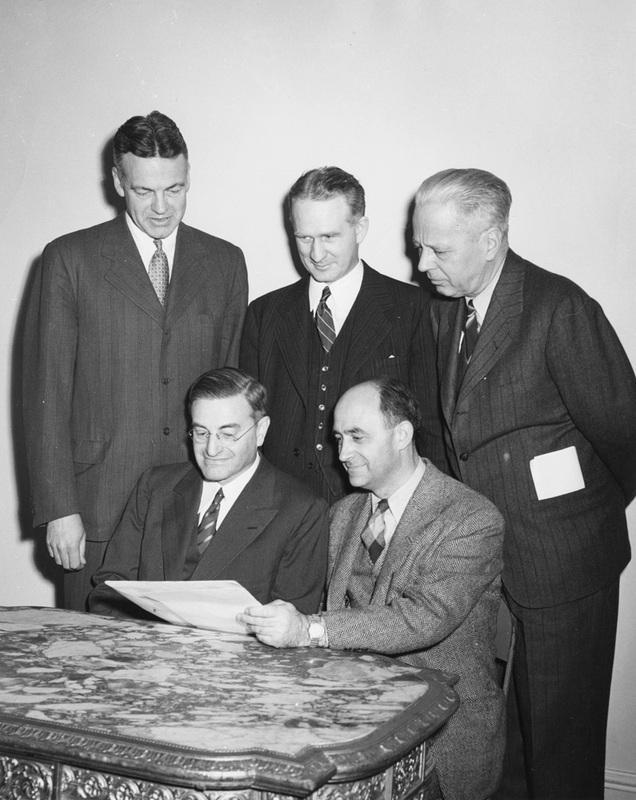 Why hadn’t Lionel claimed on the census records and World War II draft registration that he was a photographer? Why wouldn’t he have wanted to reveal that information? Was it just an avocation, not his livelihood? Did that change after the 1940s? 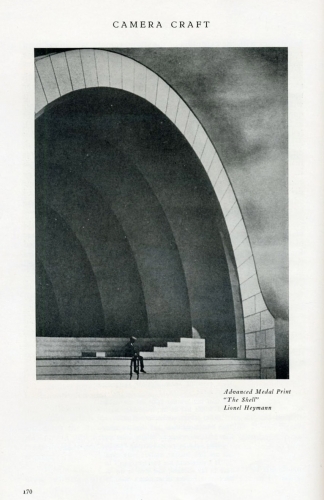 UPDATE: In the course of looking for a print of one of Lionel’s photographs to purchase (which I’ve not yet been able to locate), I found this bit of information about Lionel online, quoting from the catalog of the Sixteenth Detroit International Salon of Photography, Photographic Society of Detroit, Detroit Institute of Arts, 1947. This explains so much. First, it explains what Lionel was doing in Detroit when his brother Walter arrived in 1938. Second, it explains why Lionel did not list photography as his occupation on the 1930 or 1940 census or on his World War II draft registration. The obituary and death notice not only revealed that Lionel was a well-known photographer, but also provided more clues about his family. First, who was this sister in the death notice named Henny Mosbach Rothschild? And was she the one described as living in Brazil in the obituary? And second, who was the nephew named Robert Heyman? Since only one of Lionel’s brothers had had a child, I assume that this had to be Klaus Heymann, the son of Lionel’s brother Max. Unfortunately, I’ve not been able to yet find out more about Klaus Heymann/Robert Heyman, but I have requested the military records of a Klaus Robert Heymann from the national archives and hope that those records will relate to my cousin. If so, I will provide an update. As for the sister named Henny Mosbach Rothschild, I will address her in my next post. This entry was posted in Genealogy, Photos, Schoenthal and tagged Brazil, Chicago, Chicago Tribune, Lionel Heymann, Photographer, Photography by Amy. Bookmark the permalink. You don’t give up – and that is a good thing. Imagine there had been no obituary, you’d probably never come up with the “other” occupation. Or then you may have anyway! I probably would have googled his name, but not with photographer. Whether I would ever have put two and two together is hard to say! But the obit threw me at first—I had real doubts as to whether it was the same Lionel, except that it was Chicago and that I’d seen one sister had ended up in Brazil. Thanks, Cathy! My great grandfather was a photographer, too. 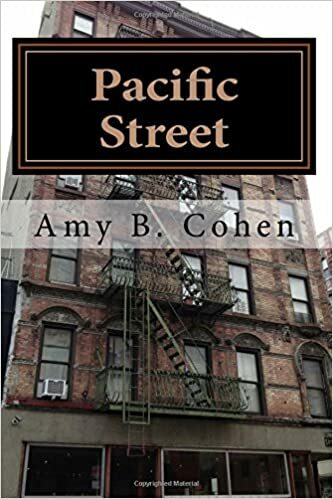 However, his “real” job was running the family mercantile and I’ve seen his occupation listed as Salesman, Merchant, Proprietor, and even Abalone Fisher. But never photographer. I have some of his photos from the early 1900’s and have seen mention of him in other places. What makes it hard for me is that while his photos are marked with him as the photographer, I can never be sure if the photo is of an ancestor or someone he knew or just a photo he took as part of the job. That’s interesting—perhaps people didn’t take photography seriously as a profession back then? There obviously were professional photographers very far back, but maybe for your GGF and for Lionel, it was not a full time job so not their principal source of income. Keeping me hanging, Amy! So interesting about waiter slash well-known photographer! It is true that a lot of artists had survival jobs. Maybe at the hotel he was both? My guess is that he did both. And your comment made me wonder—all those wanna be actors and dancers and rock stars who wait on tables while waiting for their big break: Do they fill out the census saying they are waiters or do they say “actor” or whatever is appropriate, assuming they at least have some work in the arts? Thank you for sharing your research journey! So many would have ignored information that didn’t fit their existing information. This is a lesson that you need to explore every avenue, no matter how unlikely. You never know where it will take you! It would be very cool to get one of his photographs! Thank you for your kind words and for reading the blog. I love these kind of tangents because they are like life–always full of mystery and surprise. And some of his photographs are gorgeous—I’d love to have one! Hmmmm…. What a cool find! I was not expecting this. His photos are great. I do also! I now am trying to find somewhere to buy a print. If I can find an affordable one! What a great idea. I hope you find one that is just right – lovely and well priced. Thanks! I will let ou know. I just happened to have 4 photos framed with his name. Not sure what is reasonable for you. Hi Richard, I will email you for more information. Thanks!